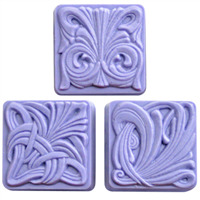 Create eye-catching soap using Milky Way Mold's award-winning line of soap making molds. Our durable, easy-to-use soap molds come in a wide variety of styles, so you're sure to find the right soap mold to fit the occasion. 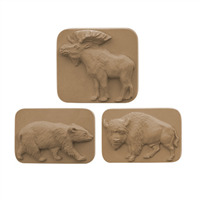 These soap molds are good for both cold process and melt and pour soap making. Milky Way Molds are constructed of sturdy plastic and have tapered cavities for easier soap removal. Size dimensions are listed for the widest part of each mold cavity. 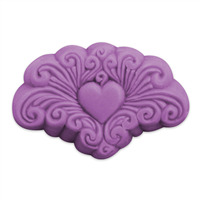 The 100% Handmade Silicone Soap Mold is the perfect mold to showcase your handmade soap and lotion bars! This silicone mold features six square cavities with raised text "100% Handmade" in presses circle. 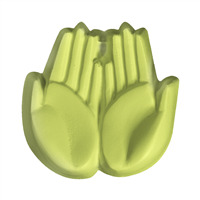 Bar Cavities: 6 Bar Depth: 1"
Bar Length: 2.125" Bar Width: 2.125"
The 2 Hands Guest Soap Mold has two welcoming hands with the palms facing up. The soft hands are ready to hold something delicate. 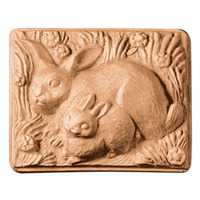 Bar Depth: 1 1/8" Bar Length: 2 5/8"
This charming, intricately detailed soap mold – featuring a mama rabbit and her bunny cuddling among the flowers – is perfect for Easter or spring. 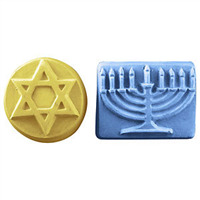 Bar Depth: 1 1/8" Bar Length: 3 1/2"
The Hanukkah Soap Mold contains a circular bar with the Star of David imprinted and a rectangular bar with a menorah. Create soaps that are perfect for holiday gifts! 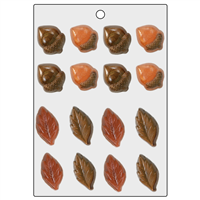 Bar Depth: 7/8" Bar Length: 2 1/8"
Your fall soap designs will be better than ever when using the Acorns and Leaves Mini Mold to create embeds/embellishments. This mold has 16 cavities - 8 acorns and 8 leaves! Create bars of soap for those who serve or have served in the Air Force with this plastic Air Force Soap Mold. 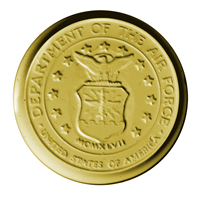 This round bar mold has three cavities with the the detailed seal of the Air Force on each bar. 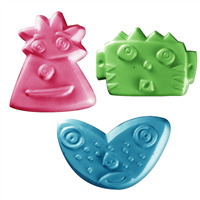 Bar Cavities: 3 Bar Depth: 1.125"
The Aliens Soap Mold has three different cartoon-like ‘aliens’. One has a triangular face with spikey hair and a mask, the second one has a rectangular face with large boxy ears, and the last alien’s face resembles a boomerang with freckles. 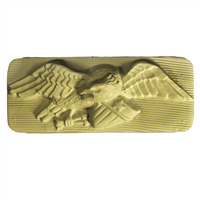 Bar Depth: 7/8" Bar Length: 2 1/2"
A bald eagle soars on this American Eagle Soap Mold. His wings are outstretched and he carries a shield with one star and vertical stripes. The bald eagle is the national bird and national animal of the United States of America, create a patriotic soap bar or lotion bar with this plastic soap mold. 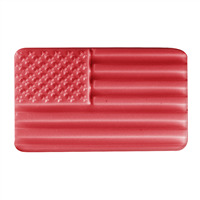 Bar Depth: 1 3/8" Bar Length: 4 1/8"
Show your patriotism with this beautiful American Flag Soap Mold! Complete with 50 stars and 13 stripes, this detailed mold is perfect for an Americana holiday or themed party. Avg. 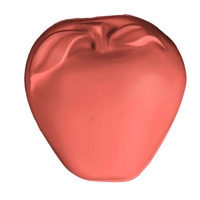 Bar Weight: 4 oz Bar Length: 3.25"
The round Wax Tart Apple mold is used for making wax tarts for a potpourri or tart burner. When the scented tart heats up, it fills the room with aroma. 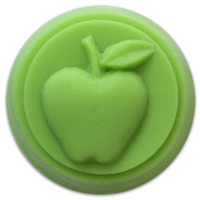 The molds are also great for small guest soaps. The Arabesque Soap Mold is an interpretation of the intertwining, flowing scrollwork often found in Arabic or Moorish decoration. 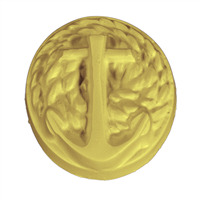 Honor those who serve in the army by creating bars of soap with our Army Soap Mold. 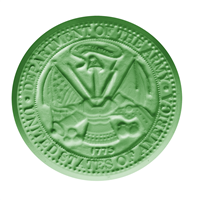 This mold has the seal of the US Army and has the words "DEPARTMENT OF THE ARMY - THE UNITED STATES OF AMERICA" surrounding the emblem. 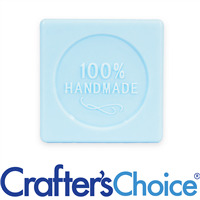 Great for Labor Day and Memorial Day Soaps. The art nouveau movement of the early 20th century was actually inspired by medieval gothic art; if you look closely, you’ll see those similarities. 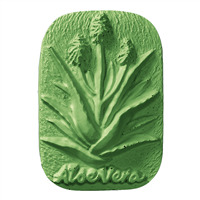 The Art Nouveau Tiles Soap Mold was inspired by ceramic tile designs. Bar Depth: 1" Bar Length: 2.75"
A companion to Milky Way’s very popular 4-in-one mold, this new Guest 4-in-One soap mold features guest-sized squares, rectangles, ovals and rounds. 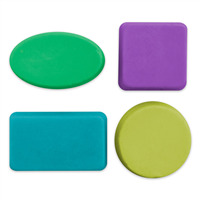 For classic soap shapes, you can’t go wrong with the 4-in-one soap mold. 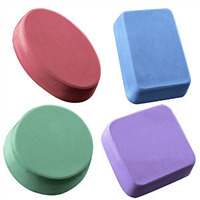 Included are oval, round, square and rectangle shapes. Bar Depth: 3.75" Bar Length: 3.25"
Show support for autism by making puzzle piece heart soaps. 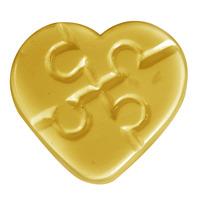 The Autism Heart Soap Mold has four cavities that are heart-shaped with the detail of four puzzle pieces. 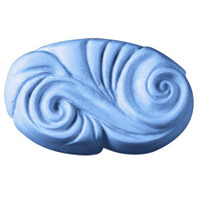 Sell the soaps made as part of a fundraiser or sell in April in support of National Autism Awareness Month. 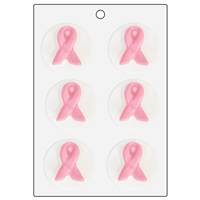 The Awareness Ribbon Small Round Mold is a round bar mold with the awareness ribbon on top. 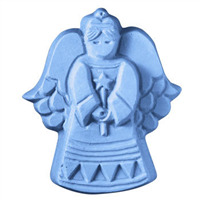 Use this mold to raise awareness for virtually any cause, and color soap accordingly. Craft cute baby bootie soaps as a baby shower favor or as a gift for an expecting mother. Color the bow pink, blue or yellow to fit the occasion. These could also be favors at a reveal party. Bar Depth: 1 1/2" Bar Length: 3 3/4"
This clear plastic mold is shaped perfectly like a little baby bottle with a bow around the neck. 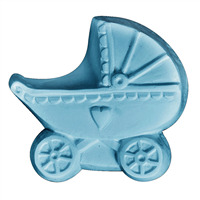 Use any of our blue or pink cosmetic colors to create soaps for baby shower favors! 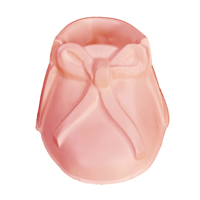 Bar Depth: 1.25" Bar Length: 4.25"
The Baby Carriage Soap Mold will steal your guests’ hearts at your next baby shower event or party! This clear plastic detailed mold's design has an umbrella top, wagon-style wheels and is complete with a tiny heart on the side. 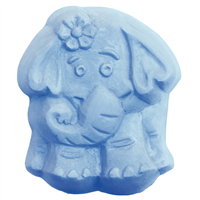 The Baby Elephant Soap Mold is features an adorably innocent baby elephant with a flower behind its ear. This mold is perfect for baby showers, kids and elephant lovers! Avg. 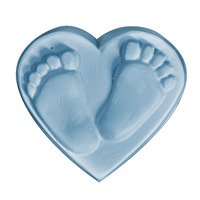 Bar Weight: 3.2 oz Bar Depth: 1.25"
Bar Length: 3" Bar Width: 2.5"
The Baby Feet Small Round Mold is a nice sized bar for Baby Shower gifts and gender reveal parties. 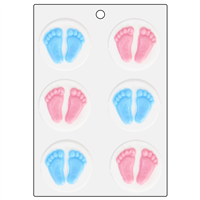 Color in pink and blue for babies, or use brown and oatmeal soap to create the look of footprints on the beach! 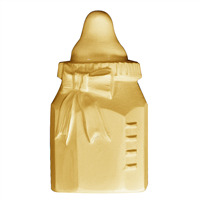 This soap mold is one of our favorite baby shower themed molds! The heart shaped mold cavities each have two tiny feet on them that can be colored blue or pink to represent a little baby boy or girl. 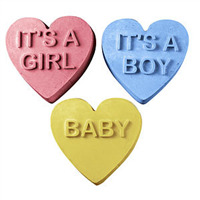 Perfect for a baby shower or to welcome the new addition into your home, the Baby Hearts soap mold features three sayings – IT’S A GIRL, IT’S A BOY, and BABY – each within a heart shape. 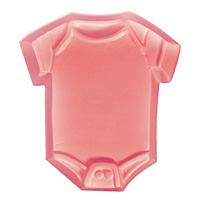 Bar Depth: 0.75" Bar Length: 2.75"
The Baby Onesie T-shirt Soap Mold will be loved by an expecting mother. The mold can be colored blue for her beautiful baby boy or pink for her gorgeous baby girl! Bar Depth: 1" Bar Length: 3.25"